This blog post veers slightly from my usual recipe posting path … but hear me out. Coffee and milk are both gluten free and (can be) somewhat local so I felt like I should write a little about my source of daily joy. My French press and fresh steamed milk combo is the secret behind my energizer bunny demeanor. There are worse vices, right? And, if you become your own barista, your wallet will thank you. I like my coffee dark and I love experimenting with different beans. Years ago, I bought a coffee grinder. Having a coffee grinder allows you to grind beans as needed – this is handy especially if you are the only one in the house drinking coffee. I keep my beans in a dark cabinet – not the freezer – and grind them daily. Grinding your own beans also allows you to grind them a little bit coarser when you want to use them in a French Press and a little bit finer when you are using them in your regular coffee pot. Step 1. Grind your beans. At first, I was concerned that I would grind my coffee beans too fine and they would find their way through the mesh of the sieve. That has not really been a problem. Put your beans in the grinder and just pulse once or twice – they should look a little chunky, not completely fine. Step 2. Boil your water. For this step, you want to stop the water just as it gets to a boil. I can peer into the top of my kettle so I can see the water just start to bubble up or I fill my pyrex measuring cup with water – about 12 ounces of water – and put the microwave on for 5 minutes. As it starts to bubble – usually around 4 minutes or so in my microwave, I turn it off and take out the water. Step 4. Pour the just-boiled water into the French press. If you are using a microwave, you can pre-measure your water. If not, measure out 12 ounces of water from your kettle and then pour it into your French press. Step 5. Cover the press but don’t put the plunger down yet. Let the beans steep in the hot water for about 3 to 5 minutes and then gently press down until the plunger can’t be pressed down any further. Step 6. Immediately pour your coffee into your mug. Never, ever let your coffee sit in the french press and hang out or it will get bitter. Months ago, I picked up this milk frother on the sale table at Sur La Table. My kids love to froth the milk. Use cold milk, pour it only as high as the line on the side of the glass, and manually pump the plunger and watch your milk expand. We have found that skim milk froths better. After you have made your milk nice and frothy, take the metal plunger out and put the glass container only in the microwave. I set it to heat on high for 60 seconds but I have to WATCH IT THE ENTIRE TIME. In my microwave, at about 40 seconds, the milk rises up and is just about to pour over the top of the frother. At that precise moment, I quickly hit the stop button and grab my deliciously warm and frothy milk out of the microwave. Carefully. Using a spoon to hold the “frothiness” back for a bit, pour the warm steamed milk into your freshly brewed coffee. Then, using your spoon, spoon some of the frothy milk over the top. Delicious. No sugar needed. It will taste like you paid 4 bucks or more at a fancy coffee shop and yet you are standing in your kitchen still wearing your slippers. Beautiful. The beans … Looking for local beans? Here in Charlotte, a few of our local coffee shops source their beans from Counter Culture in Raleigh. Wow. Very, very good. Check out their website – after glancing through a few pages, I realized that I have A LOT to learn about coffee. One of their missions is to introduce coffee lovers to the “joys of seasonal coffee drinking.” Never thought about that before … I am intrigued. My new favorite beans are from the Blue Bottle Coffee Co. I smuggled them back from San Francisco. If you are interested in coffee, check out Blue Bottle Coffee – they do some crazy things with brewing. They have recently created an outpost for us east coasters. If you are ever in NYC you should stop by … midtown Manhattan to be exact. The grinder … I don’t have a fancy grinder. I might ask for one for my birthday. 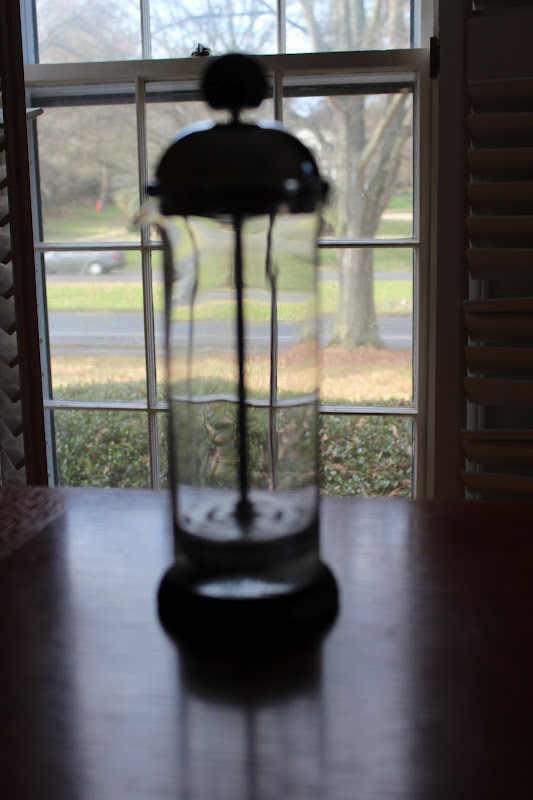 I have a basic coffee grinder made by Krups but I have my eye on a burr grinder. Burr grinders are definitely more expensive but grind the coffee into far more uniform pieces – either large or small. I imagine that a burr grinder would reduce the little bit of coffee sludge that sometimes is found at the bottom of my cup. The French Press … Mine is by Bodum. It is simple. It works. And it was certainly the right price. The frother … The frother is a tricky purchase. The first one I had was made by Bonjour. It was perfect. And then my sitter dropped it and it shattered. My husband sneaked out and bought a replacement. No good. It was by Bodum. When you buy a milk frother, take it out of the package and test the plunger. You want to feel some suction, some tightness. If there is space between the plunger and the glass, then your milk will never get very frothy. I ended up using the Bonjour plunger in my new Bodum glass and all is well now. Frothy milk is not just for coffee! 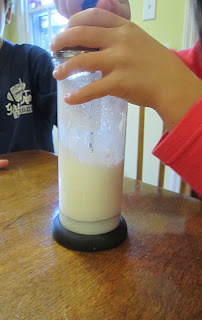 My kids love frothy milk – either plain frothy milk in a mug or poured over a small mug of cocoa. Such a simple treat! Enjoy! I know, I know! Now that it is summer, that is the important recipe! The short version … 4 generous tablespoons of coffee plus 1 cup of just boiled water and 1 cup of ice cubes. I’ve made it a few times and it comes out great. Let it steep, press down, and pour over ice. Just added Bojour maximus milk frother to my Christmas list. Can’t wait for Santa to come now! Thanks for the tip on the Blue Bottle. Had no idea! Very exciting! Katie – It’s open in midtown! Road trip?? ?